The nearest airport to Lucca is Pisa International Airport. Pisa Airport- Pisa Centrale train station transfer is provided by the PisaMover Bus service with a timetable departure of every 10 minutes and a journey time of just 8 minutes. At the Airport, the stop is located just outside the check-in area. At the Pisa Central Station, the stop is located close to platform 14, from which you can easily reach the other platforms and station’s main entrance. The cost is 1,30 or 2 euro depending on whether you buy the ticket at shops or on the bus. The CoTaPi taxi company is available at Pisa airport. 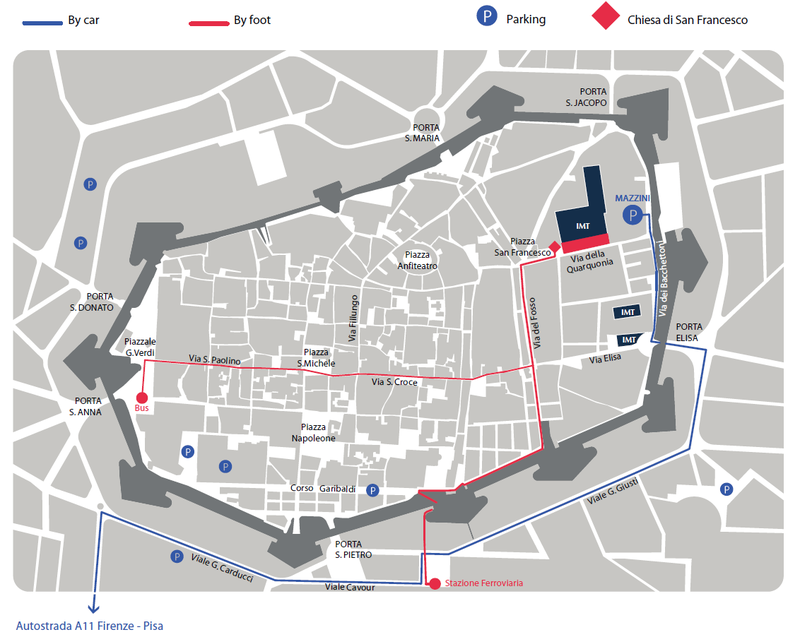 A taxi from Pisa airport to within Lucca city walls could cost around €50, and would take about 30 minutes. Trains to Lucca depart from Pisa Centrale train station. Details are available on the Trenitalia website or via Google Transit. Direct trains are Regionale trains. The journey is a little over 30 minutes by train. Prices are from €3.30. It is not possible to purchase Regionale tickets more than 7 days in advance of the day of travel. Trains are infrequent on the weekends and only the 07:04 and 07:50 trains will allow arrival in Lucca in time for a 09:00 start on Sunday. Bus travel from Pisa to Lucca is provided by VAI Bus. The VAI Bus timetable is available to download. The School can also be easily reached from Florence Airport. The easiest way to reach IMT from the Florence Airport is by taxi. You can catch a taxi from just outside the airport for an approximate cost €100. The first alternative is to take a city line bus to the Santa Maria Novella Station, in order to catch a connecting train to Lucca. A bus leaves approximately every 30 minutes from the airport and you can get more information at the following website: www.ataf.net. More information regarding trains between Santa Maria Novella and Lucca can be found here. The whole journey (bus+train) will take approximately two hours. The second alternative to get to Lucca is to take an "VAI BUS" interurban bus; the bus stop can be found immediately next to the airport and you can visualize the schedule of the connections on the following website: www.vaibus.it. The journey will take approximately one hour and forty-five minutes. The Lucca Train Station is directly connected to the main Tuscan provinces and tourist locations such as: Pisa, Viareggio, Montecatini, Pistoia, Florence. You can check connections and timetables at the website of the Italian State Railways website.